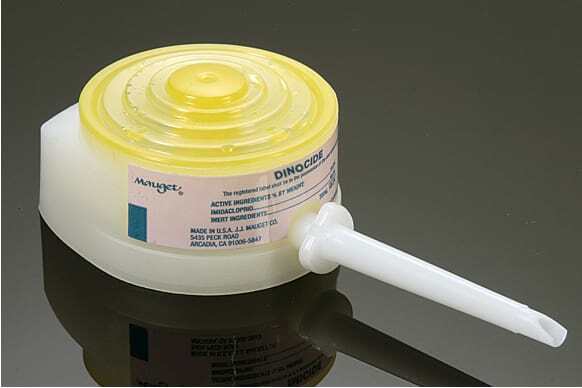 Mauget’s newest fast acting tree injection product DINOCIDE in Generation II capsules is a CAUTION labeled closed-system insecticide containing 12% dinotefuran. • Aimed at controlling scale insects, a class of pests that harm trees and shrubs by sucking plant juices from tree leaves, twigs or bark. Members of the class include Q and B biotype whiteflies, Japanese beetles, emerald ash borers, mealybugs and flathead borers. • May be applied in combination with other insecticides such as IMICIDE or ABACIDE 2 where control longer than 16 weeks is desired for a more broad-spectrum treatment. • May be Combined with certain fungicides when treating for beetles that carry fungi (ambrosia), an additional treatment of fungicide may improve management strategies. Materials to consider are fungicides labeled for use against vascular-inhabiting fungi. 2mL, 3mL, 4mL, 6mL @ 24 capsules per box. Shipping box contains 12 Cartons.